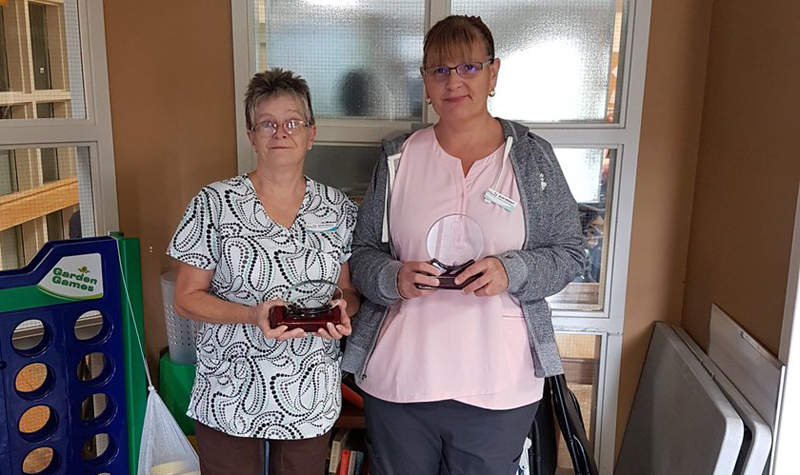 Wildwood Care Centre PSWs Jackie Iredale (left) and Jean Wright (right) are seen here holding their Circle of Radiance awards. Jackie was named the home’s Everyday Hero and Jean Wildwood’s Inspired Leader. Wildwood Care Centre personal support worker (PSW) Jackie Iredale says that while she is honoured to have been named the St. Marys, Ont. long-term care home’s 2018 Everyday Hero, she considers the qualities that got her nominated by her peers for the award to be part of her job duties. The Everyday Hero Award is given out annually by each of OMNI Health Care’s 18 long-term care homes to recognize staff members who demonstrate extraordinary dedication to residents and co-workers. Jackie has been working at Wildwood Care Centre for almost 18 years. While she says she has many fond memories of working at the home, it’s the simple things her job brings her that give her the most pleasure. “Making the residents smile, and giving a helping hand with the residents – it’s just being here,” she says. Jackie says working in long-term care is an enriching career for anyone interested in the health-care sector who has the right qualities. “If you have an open heart and compassion, there’s no job that’s better,” she says. Wildwood Care Centre recently hosted a celebration to honour the home’s Inspired Leadership and Everyday Hero Award recipients. Jean Wright was named Wildwood’s 2018 Inspired Leadership Award recipient. Keep reading The OMNIway for future stories from Wildwood Care Centre.